This is a great little murder mystery/ thriller with some complex motivations. It is an unusual setting and introduces a Brit Cit Judge too. The art is also noteworthy because of some thumbnail sized panels. For a single issue story this causes a lot of fuss. Once again we see the return of Dredd’s racism against those of Far Eastern descent. Obviously you expect Perps to show such behaviour as it is a shortcut to telling you they are the bad guys. A technique slightly better than making them have a black hat or a disability. 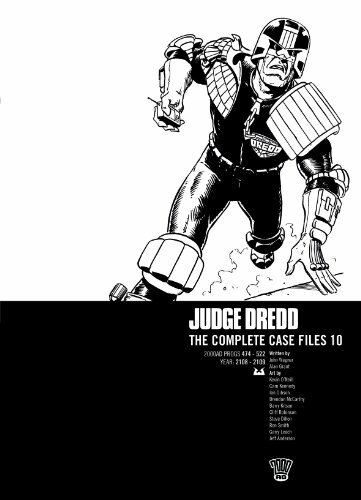 But Dredd is famously neutral in his treatment of all criminals and citizens. How does calling people Charlie Chan as a denigration reflect this? If it is revealed later that Dredd has some bias about a particular ethnic group this would make an interesting story but I suspect that won’t be the case. A good satire focussing on whether or not it is possible to actually live within the law or are all citizens doomed to failure.